I’ve reduced the plot for your benefit so you won’t have to read through all 350 pages. 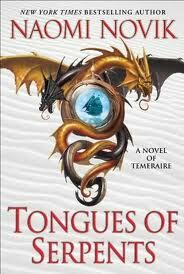 Captain Laurence and Temeraire, accompanied by some companies from previous stories, arrive in Australia with three dragon eggs. The goal for our exiled duo is to set up a covert – essentially an air-force base for dragons – in the penal colony of Sydney. After arrival, the pair find themselves thrust into some incredible non-complicated political problems. Do they support the rightful, but deposed and extremely unpopular Governor Bligh? Or do they support the leaders of the revolt – not prisoners but the small group of actual merchants and officers of the New South Wales Corps – the only armed forces in the territory. Hmm, what to do!? After this tidbit of interesting information, nothing happens. Exactly. This is the problem. No witty conversations with both sides trying to find a middle ground, no conflict resolution. Instead, Novik’s novel loses it’s focus. Wheras Laurence was supposed to be founding a covert, nothing happens. In fact, it almost seems as though the writer was seriously lost for ideas. They trundle around a bit, then, following a glimmer of story potential, they set off with a pair of other dragons to build a road into Australia’s wilderness. Novik misses several chances to return the story to it’s Napoleonic air and naval conflict roots. Will and Temeraire are offered a chance to do some privateer in the nearby trade lanes for England, but Novik ignores this opportunity with the insertion of the road building idea. Eventually this turns into a “follow the smuggler’s evidence to see where it is coming from” but in the process, they get an egg stolen and spend 50% of the book trying to find it. Here is actually on of the best components of her book. Regardless of content, Ms. Novik can certainly describe the wilds of Australia. She accurately portrays the grandeur and loneliness of such a massive, open, desert. Her use of “burrowing velocoraptors on speed” (in my own words) to insert a feeling of danger and alertness was spot on. But overall the book lacked focus. In the end, they find the (now hatched and grown) dragon, as well as a surprise. Guess what? Those pesky….Chinese! (not French, they aren’t even IN this book) have set up a not-so-secret trading post on Australia’s North Shore. After the standard feasting and happiness from the local magistrate over their incredible journey, Laurence and Termeraire realize they have come all this way for very little, as there is nothing they can do to remove the post, and have no orders to do so. A British squadron shows up (magically almost) with orders to destroy the post – Deus Ex Machina anyone? – Of course ,the Chinese are more prepared than the English suspect, and with a quick whiff of sea serpent, the ships are toast and the Chinese are a tad annoyed. This was the only part of the book that stayed true to the overall theme of these stories. It lasted four pages. The gang tromp/fly all the way back to Sydney where….nothing is accomplished. The End.